Adobe ColdFusion solves the day-to-day challenges of Internet application development, allowing you to be extremely productive as you create and deliver engaging online applications. Because it fits into any IT environment, you can use ColdFusion for everything from small departmental applications to highly scalable, reliable implementations of your most important business applications. Take Adobe ColdFusion for a test drive to see what it can do for you! · ColdFusion 8 introduces the new Server Monitor and Multiserver Monitor. By providing information about the server â€' including requests, queries, memory usage, and errors â€' the Server Monitor allows you to troubleshoot and fine-tune applications in development and in production. You can also set alerts and other actions to help prevent memory problems, slow pages, or other issues that would negatively impact a user's experience with the application. · ColdFusion 8 applications can dynamically generate and interact with PDF documents and forms for a printable, portable way to intelligently capture and share information. · With ColdFusion 8, you can specify any .NET object â€' either local or remote â€' and use it in your ColdFusion application, just like any Java or other object resource. · ColdFusion 8 applications can programmatically access Exchange Server functionality such as calendars, tasks, and contacts. · ColdFusion 8 introduces an Eclipse plug-in debugger. Use it to set breakpoints, watch variables, and step through code, making it easier to debug all your application code. · ColdFusion 8 now includes Adobe LiveCycle Data Services ES (formerly Flex Data Services) and other data exchange improvements to simplify the data-enabling of rich Internet applications (RIAs) you build with ColdFusion and Flex. · ColdFusion 8 allows you to set ColdFusion mappings and custom tag paths on a per-application basis. · ColdFusion 8 introduces the new CFTHREAD tag, which allows you to create, end, join together, or temporarily suspend the processing of specific ColdFusion threads. · ColdFusion 8 adds more than 50 new tags and functions for creating and manipulating images, from simple to sophisticated. For example, the new CFIMAGE tag provides shortcuts to the most common image actions, including reading, writing, resizing, rotating, and converting images. · ColdFusion 8 allows you to dynamically create multimedia experiences and eLearning courses with animation, audio, and video. These high-quality, on-demand presentations are generated on the server with up-to-the-minute data and content from multiple external sources. · ColdFusion 8 introduces the new CFFEED tag, which can read and create RSS and Atom feeds in commonly used formats, so you can quickly and easily create complex content syndication applications. · ColdFusion 8 introduces two new tags, CFZIP and CFZIPPARAM, so you can manipulate ZIP and JAR files for working with file archives. · ColdFusion 8 allows you to create multiple ColdFusion Administrator and Remote Development Services (RDS) accounts with individual permissions, so you can tailor Administrator and RDS access to fit your specific security needs. The roles assigned to a user determine which pages in the ColdFusion Administrator and which functions in the Administrator API a user can access. · ColdFusion 8 adds several new file manipulation functions to the ColdFusion Markup Language (CFML), most notably the ability to read and write large files in defined segments, rather than in a single operation. · ColdFusion 8 adds several highly requested improvements to ColdFusion components (CFCs), including the ability to create interface definitions, use J2EE session replication in a cluster, have access to the CFCs in session data across all the machines in a cluster, and use the new onMissing Method function. · ColdFusion 8 now includes RSA BSAFE Crypto-J libraries, which provide FIPs 140-certified strong encryption. · ColdFusion 8 introduces a completely new version of the ColdFusion Report Builder. Use it to create high-quality, structured reports with more output choices and a more consistent look and feel throughout your applications. You can also create and apply cascading style sheet (CSS) definitions to reports, export your reports in HTML or XML format, and create report styles for all of your reports. · ColdFusion 8 provides a new DBINFO tag to programmatically access information about a data source, allows stored procedures and queries using CFQUERYPARAM to be cached, and much more. Plus, there is expanded database driver support with new options for SQL Server 2005, Oracle 10g, Sybase ASE15, MySQL 4 and 5, PostgreSQL 8, and others. · ColdFusion 8 makes it much simpler to code tags with many attributes. You can now specify an argumentsCollection attribute in most tags to specify the tag's attributes in a single structure. · ColdFusion 8 allows you to create arrays and structures implicitly in assignment statements without using the ArrayNew or Structnew functions. The result is cleaner code with less typing. · ColdFusion 8 offers broad platform support with notable additions of Mac OS X on Intel, JBoss, 64-bit support, JDK 1.5 and JDK 1.6, and support for VMware and Microsoft Virtual Server. · The Trial Edition contains all of the Enterprise Edition features and will timeout after 30 days from the time you install the product. After the timeout period, the Trial Edition will revert to the Developer Edition. · The Developer Edition is a free, fully functional version of ColdFusion for the local development of applications that are intended to be deployed on either ColdFusion Standard or ColdFusion Enterprise servers. Access to applications running on a Developer Edition server is limited to two client machines. You cannot download any crack or serial number for Adobe ColdFusion on this page. Every software that you are able to download on our site is legal. There is no crack, serial number, hack or activation key for Adobe ColdFusion present here. Our collection also doesn't contain any keygens, because keygen programs are being used in illegal ways which we do not support. All software that you can find here is freely downloadable and legal. Adobe ColdFusion installation package is prepared to be downloaded from our fast download servers. It is checked for possible viruses and is proven to be 100% clean and safe. Various leading antiviruses have been used to test Adobe ColdFusion, if it contains any viruses. No infections have been found and downloading Adobe ColdFusion is completelly problem free because of that reason. Our experts on malware detection tested Adobe ColdFusion with various spyware and malware detection programs, including fyxm.net custom malware and spyware detection, and absolutelly no malware or spyware was found in Adobe ColdFusion. All software that you can find on our servers, including Adobe ColdFusion, is either freeware, shareware or open-source, some of the software packages are demo, trial or patch versions and if possible (public domain licence), we also host official full versions of software. Because we want to be one of the fastest download sites on the web, we host all the software including Adobe ColdFusion on our servers. You cannot find here any torrents or download links that would lead you to dangerous sites. 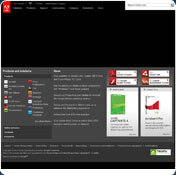 Rate Adobe ColdFusion 9 (Centaur) Beta / 8!